Seriously. Apatosaurus is just nuts. 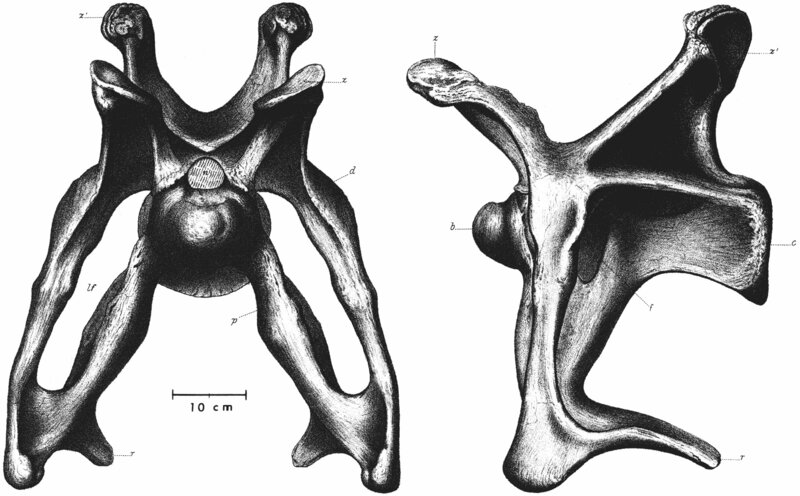 Pursuant to a comment I just made on the previous post, here is cervical 8 of YPM 1980, the holotype of Brontosaurus excelsus, now of course known as Apatosaurus excelsus, in anterior and left lateral views, scanned from plate 12 of Ostrom and McIntosh 1966. Look on my cervicals, ye mighty, and despair. You see? I wasn’t kidding. This thing is beyond crazy. The dorsoventral height of its parapophyses alone exceeds that of the centrum and neural spine together. What the heck was it doing with that thing? Seriously. It makes no mechanical sense whatsoever. To the best of my knowledge no-one has ever even advanced a hypothesis about those honkin’ great cervical ribs … and I am not about to break that streak. And here I always thought of Apatosaurus as a sort of milquetoast sauropod. Maybe there was an attachement for extra-strong breathing muscles so the thing could lift its head higher without suffering from the difference in altitude? (We have a heart rate monitor that records altitude and it can tell the difference between stories in our house.) Or for raising the blood pressure do it could raise its head higher? Or for breathing underwater in spite of from depth compression? Well, I’ll advance a hypothesis: Apatosaurs used those cervical ribs to support enormous folds of skin on their necks that allowed them to inflate their throats into gigantic resonance chambers. This allowed the Apatosaurs to produce low frequency noises loud enough to knock large predators off their feet and to signal to others of their own kind many, many, miles away. In deference to opinions expressed in the comments on the previous post, I will forgo the giant smilie I’d otherwise have used above. With the correct geometry of bone in the spine, muscles pulling below the ball joint can relieve some of the compression caused by muscles pulling above it. I can’t make sense of that, P.J. As you say, muscles can only pull. So if we have dorsal muscles pulling backwards on the spine and epipohyses, and ventral muscles also pulling backwards on the cervical ribs, the the results will be even more compression on the centrum. I am not a paleontologist, so I am not familiar with the correct terminology for the various components of a vertibrae, so bear with me. If you look at the rearward facing part on the lowest projection, it is my belief that there is an overlap of that and the next vertibrae toward the rear of the animal, so that a muscle connecting the two when contracted, will in fact pull the lower part of the vertibrae apart, thus reducing the pressure on what you say is the centrum. It is also likely that this set of muscles would be used to swing the head from side to side. My email address is P.Morant@btinternet.com if you would like to contact me, I could send you a drawing of what I am getting at. The rearward-facing part of the lowest projection is the cervical rib — it’s homologous with the ribs in your torso, but fused firmly to the vertebra (at least in mature animals) and as you way points backwards. I think what you’re describing is the “ventral bracing hypothesis” of Martin et al. (1998). If so, kudos for pulling straight out of the hat like that. But I’m afraid it won’t fly. 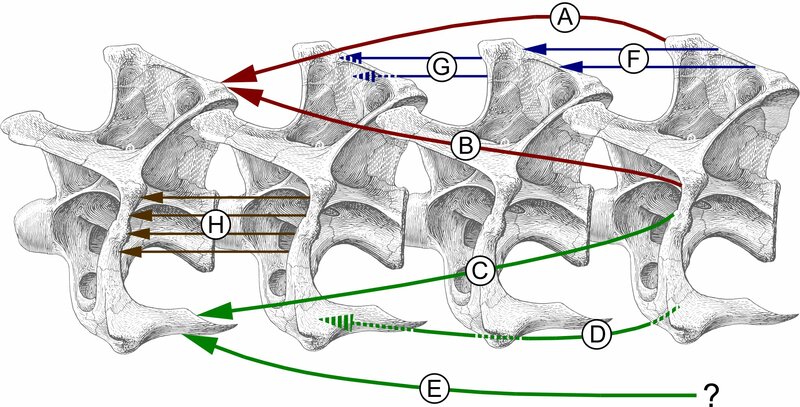 There are lots of reasons, and in fact Matt and I have a paper in prep on just that, but on of the more obvious reasons with Apatosaurus is that the cervical ribs just aren’t long enough to overlap when consecutive vertebrae are articulated — as you can see in this composite from another of our papers. I used to visit the Natural History Museum in London and look at the skeleton of Diplodocus and wonder why the bottom of each vertebrae was so long and extended far beyond the junction of that one and the next. To connect muscles in such a way as to convert a pull into a push seemed to make sense. Many thanks for the drawing, as you say, the projection is too short unless erosion has shortened them. I will send a drawing anyway, should give you a laugh. P.J., I think I see what you are saying–maybe you can correct me if I’ve misunderstood. But the fulcrum for all of these muscular actions is still the articulation between the two centra (the ball-and-socket joint about 2/3 of the way up on this particular vertebra). If there was some other fulcrum, muscular contractions below the vertebrae might work as you suggest. But there’s only the one, so contractions above or below the vertebra will tend to load the body, or centrum, in compression. Hope that makes sense! As you point out, in Apatosaurus the cervical rib is not long enough to support my idea of muscles in tension reducing the load on the centra. Would not this be possible in Diplodocus and others which have the cervical ribs overlapping? I find the “bracing” theory of Martin a bit unsatisfactory, as it would seem to add a certain rigidity in tension below the centra, thereby adding to the load on the dorsal muscles and centra. I’m afraid it won’t work. The ribs of Diplodocus are not long enough either; and for those sauropods whose ribs are long enough, like Giraffatitan, they are nowhere near robust enough. Many thanks for the information, that answers something that has puzzled me for years. In future I will concentrate on something I know something about, which is not a lot. Let me strongly encourage you not to back off from palaeo just because one interesting idea you had didn’t pan out. The way you get to know about a subject is by lunging in, which is what you’ve started to do here. When I started out (as Matt will tell you, having been my principal mentor) I came up with a couple of dozen ideas before I started to settle into a groove of realising what kind of thing would and wouldn’t work. (Not that I have that down now, or anything.) In short, if palaeo interests you, then by putting the work in, you can make a contribution. I am still interested in the subject, and would dearly love to build a time machine to go back and look at these creatures live, but I will be 84 this year so my time is getting a bit short. Well if you build a time machine go forward in time and get the life extension treatments from the future doctors first. Then you will have the time to do whatever you want ;-) .